How quickly things can change. 48 hours ago the S&P 500 had broken key support, and looked poised for a move lower as the “double top” crowd was chirping (hand raised). Today, on the back of a slew of better than expected earnings reports the market is having its best day of the year. Now the conversation switches from breaking support to testing yearly highs – just that quickly! 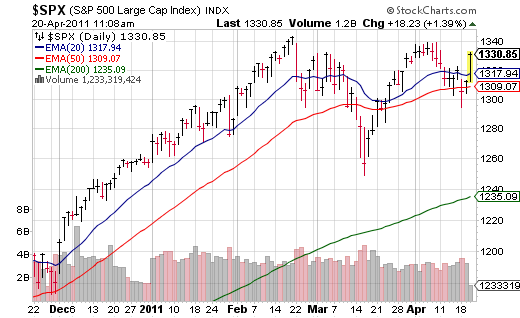 We’re only 9 points away from that stubborn 1340 level that served as resistance a few weeks ago. I had mentioned earlier in the week that we have only had two instances of three down weeks in a row since the beginning of 2010; after Monday’s open one thought this would be the third, but not anymore. Once more congrats to those who said in the comments section to BUY THE DIP – the only strategy that works anymore.